Oil advanced from the highest close in more than 10 months before U.S. government data forecast to show crude stockpiles dropped for a third week, trimming a glut. Futures climbed above $50 a barrel in New York after advancing 2.2 percent on Monday, the biggest gain in three weeks. Inventories declined by 3 million barrels through June 3, according to a Bloomberg survey before data from the Energy Information Administration on Wednesday. Royal Dutch Shell Plc said it won’t attempt to repair a key pipeline in Nigeria for now after militants attacked it a second time last week. Crude has surged about 90 percent from a 12-year low in February amid unexpected disruptions and a continuous slide in U.S. output, which is under pressure from the Organization of Petroleum Exporting Countries’ policy of pumping without limits. Saudi Arabia will maintain the same level of production capacity until 2020 under a new economic reform plan approved by the government to reduce its reliance on oil. “U.S. crude production is trending lower,” which is “gradually bringing down the surplus production and putting an end to stockpiling,” Jens Naervig Pedersen, an analyst at Danske Bank A/S in Oslo, said by e-mail. “This is an underlying supportive factor” for the coming year. West Texas Intermediate for July delivery rose 54 cents to $50.23 a barrel on the New York Mercantile Exchange at 1:14 p.m. London time. The contract gained $1.07 to $49.69 on Monday, the highest close since July 21. Total volume traded was about 31 percent below the 100-day average. Brent for August settlement rose 63 cents to $51.18 a barrel on the London-based ICE Futures Europe exchange. Prices on Monday closed at the highest since Oct. 9. The global benchmark crude traded at a premium of 43 cents to WTI for August. For a story on the cost of Saudi Arabia’s energy projects, click here. The 20-company Stoxx Europe 600 Oil & Gas Index rose 2.1 percent to 279.76, after touching its highest in more than two weeks, with Tullow Oil Plc and Amec Foster Wheeler Plc the biggest gainers. Shell Chief Financial Officer Simon Henry said the company had to withdraw repair crews last week after a second attack against the 48-inch Forcados export pipeline. The pipe links storage tanks onshore with an offshore port. 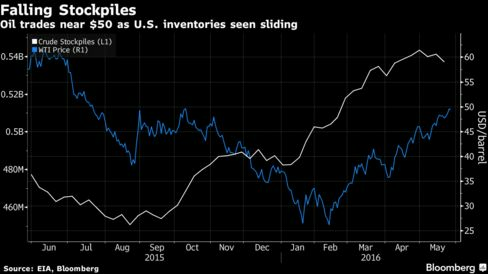 Crude stockpiles at Cushing, Oklahoma, the delivery point for WTI and the biggest U.S. oil-storage hub, probably declined by 700,000 barrels last week, according to the median estimate in a Bloomberg survey. Nationwide inventories dropped by 1.37 million barrels to 535.7 million through May 27, according to the EIA. Saudi Arabia will maintain output capacity at 12.5 million barrels a day until 2020, according to a draft of the National Transformation Program distributed to reporters in Jeddah. “The much-anticipated rebalancing of supply and demand now seems within reach,” Trafigura Group Pte CEO Jeremy Weir said in the trading firm’s first-half report. Oil may never get back to $100 a barrel and current prices represent an opportunity to reset the industry’s cost base, said Shell Chief Executive Officer Ben Van Beurden. Eni SpA said 65,000 barrels a day of supply was halted Friday after a militant attack in Nigeria.